﻿The True Presence of Jesus in the Eucharist can be a difficult concept for children to understand. How can something that looks like bread/wine and taste like bread/wine really be Jesus? We can teach the children with the words of Jesus and the truth of our faith. An excerpt from An Introduction for Children: “As you know, the Eucharist, which we are able to receive during Mass, was given to the Apostles by Jesus during the Last Supper. After Jesus changed the bread and wine into His body and blood, He gave it to His Apostles to eat and drink. The bread and wine was changed, actually transformed, into the real Body, Blood, Soul and Divinity of Jesus, the Son of God. “Although the consecrated host does not look like the body and blood of Jesus we see on a crucifix, His Real Presence is hidden within the appearance of a small white consecrated host (altar bread). This is a great miracle, a mystery, something we cannot fully understand. Yet we have the words of Jesus Himself who said in the Gospel of John: “My flesh is real food and my blood is real drink"
1. Show the children the printable of the wheat and grapes. Talk with the children about the Host is made by human hands from wheat and the wine is made from grapes. 2. Next, show the printable of the Host. Show them that the Host is made up of wheat which is represented by all the small red wheat stalks. 3. Hold up the red Faith printable and tell this that this red sheet represents our faith, our trust, in Jesus and all He told the disciples and us. We believe because Jesus said it is true. The Holy Spirit helps our faith be strong. The Holy Spirit is often represented as fire, thus the red coloring of our “Faith.” The Holy Spirit is also represented as a dove, thus the dove in a flame drawing on the bottom of the “Faith” sheet. 5. Tell the kids that you are now going to look at what appears to be bread, the Host which is consecrated by a priest at Mass, with faith made strong by the Holy Spirit. Overlay the Faith sheet on the Host. The children will see the image of Jesus appear. Our Faith helps us to see and know that Jesus is truly present in the Host, the Consecrated Host, hidden within. Print this sheet in color. Discuss with the children how the Host is made by human hands from wheat and the wine is made from grapes. ..﻿Print this Host sheet in color. Point out how the Host is made from wheat. (All the red overlays are mini stalks of wheat.). Copy this Faith sheet on to red vellum paper which is available for purchase by the sheet in the scrapbook section at many craft stores. ﻿Print this Cup of Blood sheet in color. Point out how the wine is made from grapes. (All the red overlays are mini grapes.). This activity can be used as a follow up to Activity 1a: Seeing the Body and Blood of Jesus with Faith or as a stand alone. Sending their completed project home with the children is an excellent way to not only teach the children, but also reach their parents to affirm our Catholic belief of Jesus' True Presence in the Eucharist. ​ Pope Benedict said, "The proper meaning of catechesis, in fact, must be this: to bring the flame of Jesus' love, even if it is a small one, to the hearts of children, and through the children to their parents, thus reopening the places of faith of our time." Children can color the monstrance before gluing other pieces on it. 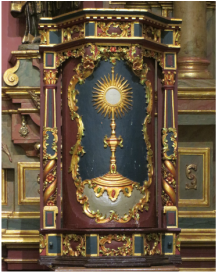 The tab will be folded under the host and glued to the center of the monstrance. This Jesus in the Host will be glued on top of the tab in the center of the monstrance. The traditional Adoration song, Come Adore, (English version of Tantum Ergo) is packed full of meaning. Here is a reflection on the words of Come Adore with questions and possible answers. As the students understand the song in more depth, it will hopefully lead them closer to our Lord as they sing it during Adoration. The Story of Fatima is a wonderful teaching story for children on (1) visiting Jesus in the Blessed Sacrament, (2) behaving respectfully before Jesus in Adoration, (3) choosing to say the prayers taught by the angel and Our Lady, (4) saying the rosary thoughtfully, and (5) giving Jesus our pains in reparation for the sins of the world. Jesus in His Sacramental Garment lesson is based on St. Peter Julian Eymard’s quote: "Our Lord did not want to remain on earth only through His grace, His truth or His words; He remains in person. We possess the same Lord Jesus Christ Who lived in Judea, although under a different form of life. He has put on a sacramental garment, but He does not cease being Jesus, the Son of God and the Son of Mary." Using several photos of Mrs. Kirking in different garments, it is established that all three pictures are of Mrs. Kirking. The garments do not change who she is. The lesson continues with different images of Jesus in different garments including Jesus in His sacramental garment. It is established that Jesus' garments do not change who He is - or God. 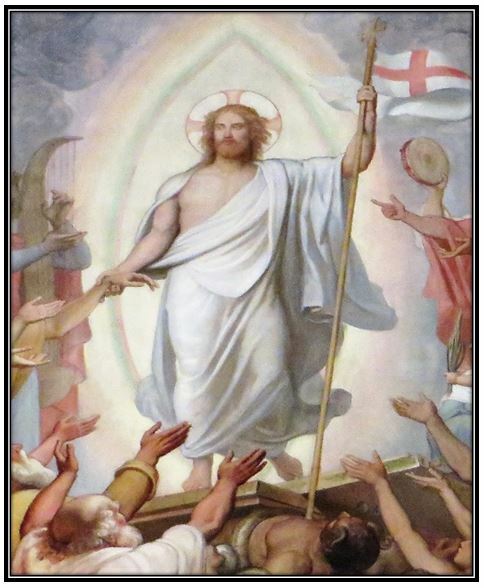 Jesus wears His "resurrection garment" in heaven and here on earth His "sacramental garment." This makes a great connection for children both for Mass and for Adoration.